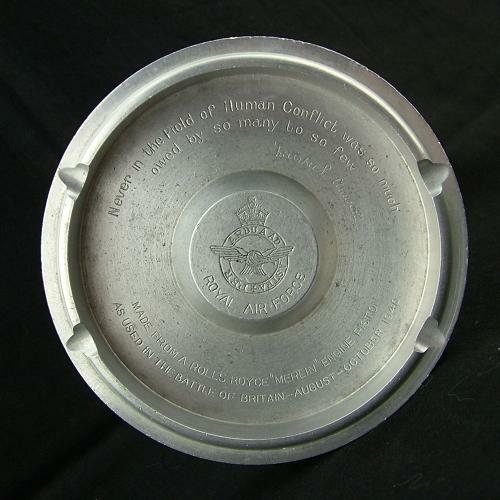 Alloy ashtray created from the piston of an original Rolls Royce 'Merlin' engine as used in Spitfire and Hurricane fighters during the Battle of Britain. Approximately 13.5cm diameter and 2cm deep. Engraved with British Prime Minister Churchill's signature and part of his famous speech 'Never in the field of human conflict was so much owed by so many to so few'. Also has the RAF crest to the centre. Nice period fund raising collectable. Minor pitting and wear but should polish up well. Good '+" condition. Stock code M23266.